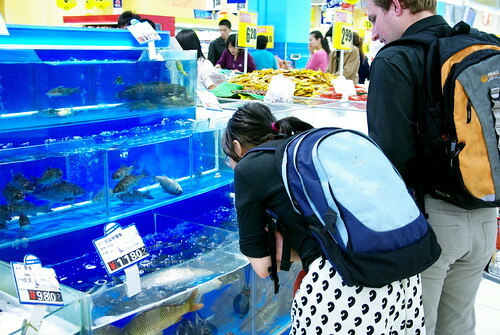 In Chinese grocery stores, and this is true for the Overseas Pan-Asian ones too, your fish must be fresher than fresh. However, this sometimes leads to some inconveniences, like dead fishes. 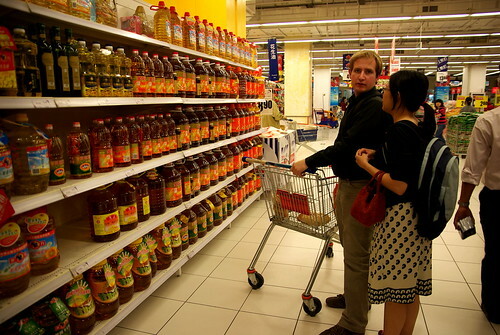 “We started buying in very large quantities, to save money when the food prices rise occurs”, admits Fiona as we traverse the cooking oil section. Before I left Hong Kong, newspapers were doing their frontpages with the food scare and people stocking up on Thai rice. 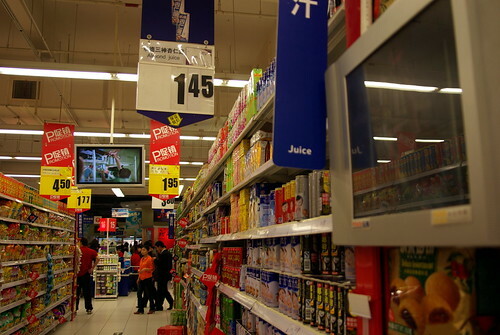 How can you not have in-store advertisement? They are in every row, and are not silent at all. 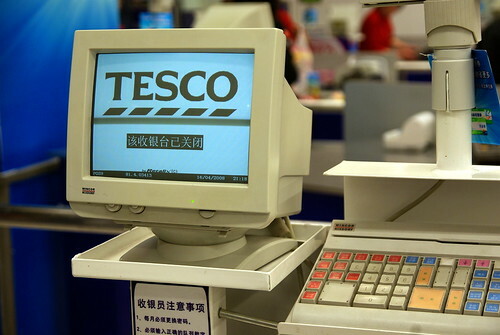 Of course, Tesco is not just for your grocery needs. 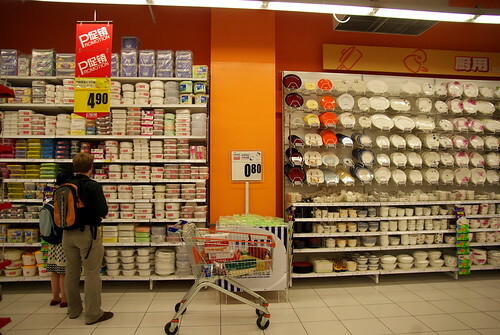 You can find kitchen ware and tools, but also appliances, washroom items, toys, and office supplies. 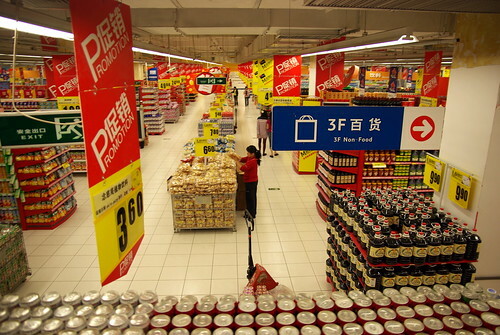 Supermarkets are huge in China (or tiny in Canada) and span two floors on a commercial complex, things having the tendency of being built on top of each other. 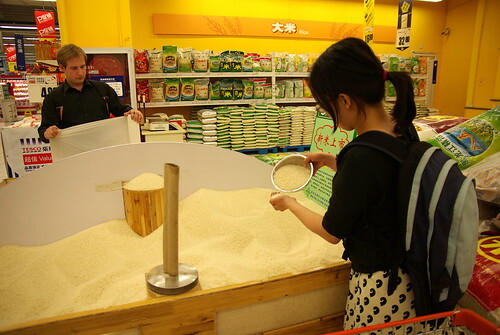 Environment is big in China too, as it is in the rest of the developed World. 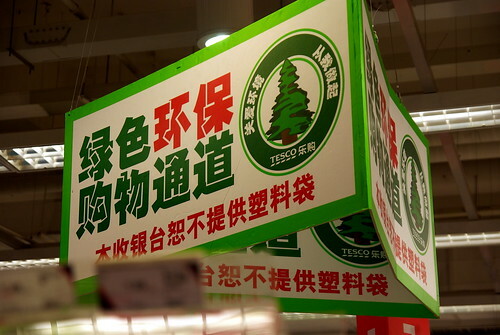 Free plastic bags given out by supermarkets and shops are to be banned in China, starting on June 1st, 2008. 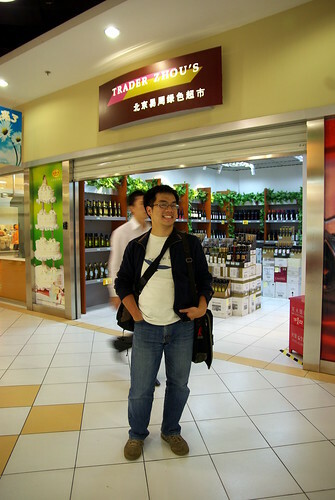 Last but not least, Trader Zhou’s! 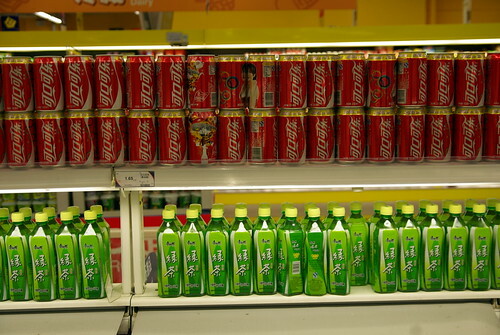 I alternate between living in Montreal and Beijing. It’d be cool to meet you while we’re both here. Never heard of this place. 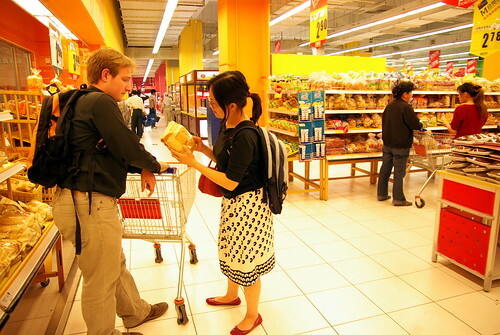 I usually shopped at ChaoShiFa and visited Carrefour and even Walmart a few times.